The Defender® 4 Narrow Plastic Pigeon Spike is a great little invention for getting rid of pigeons from your home. Any narrow ledge, sill or beam that has a depth of up to 10 cm (4 inches) can be protected from perching, roosting or nesting pigeons and birds. 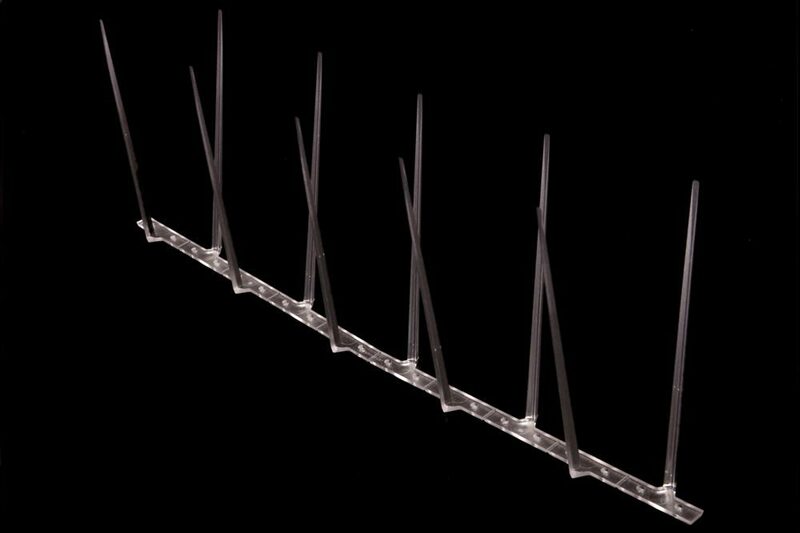 As they are made of a clear polycarbonate plastic, the narrow pigeon spikes become virtually invisible once installed. They are also UV stabilised, so will continue protecting your property for years to come. All our plastic pigeon spikes are made by us, Jones and Son in Devon. Please feel free to visit our warehouse, chat with our friendly advisers and see how our spikes are made. Defender® 4 Narrow Plastic Bird and Pigeon Spikes will protect a depth of ledge up to 10 cm (4 inches). If the ledge width is 10 cm or more, simply attach a second row of spikes leaving a small a gap as possible between the tops of the pins. Alternatively, you may prefer to use one row of our Defender® 8 Wide Pigeon Prevention Spike that will protect ledges up to 20 cm (8 inches) Defender® 8 Plastic Bird and Pigeon Spikes. 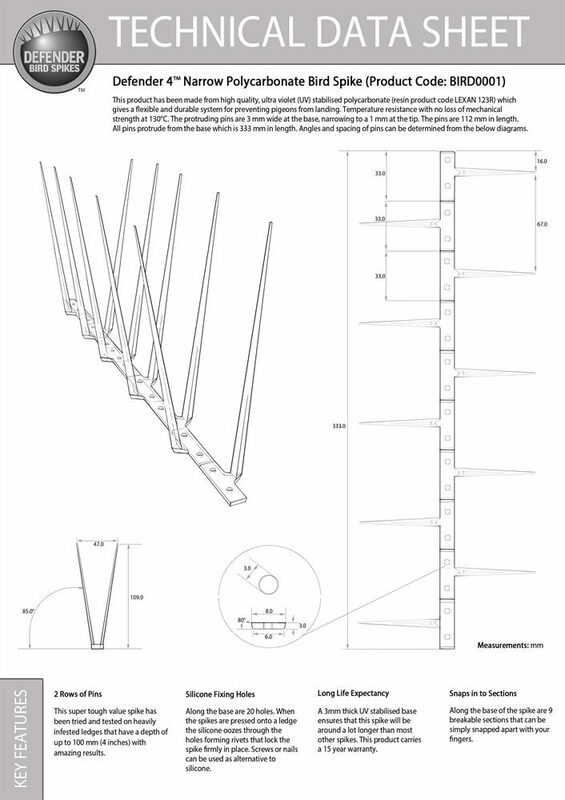 The Defender® 4 Pigeon Prevention Spike is 33.4 cm (13 inches) in length. To cover a 1 metre long ledge or sill, 3 strips of Plastic Pigeon Spikes are needed. 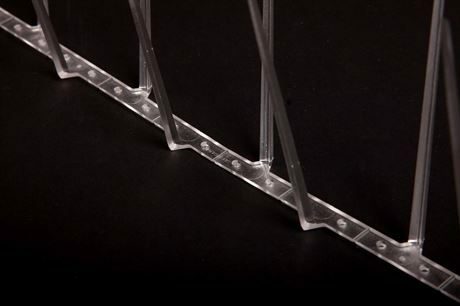 However the plastic spike bases can be snapped to shorter lengths from just 3 cm (1 inch) long. All the Defender® Bird and Pigeon Spikes are humane. The pins that protrude at angles from the base simply act as a barrier to the pigeon, making it difficult for birds or pigeons to approach the ledge they previously used to perch on. The plastic pigeon spike pins do not injure the birds as they do not come into contact with them. They just move on to other more accessible roosting or nesting sites. Defender® 4 Narrow Plastic Pigeon Spikes are very simple to fit to ledges and surfaces that need protecting from pigeons and birds. These Pigeon Prevention Spikes are lightweight enough to fix to pipes and beams using cable ties or, for a more long term solution, they can be screwed or nailed to the surface using the small holes already in the base. We recommend using Defender® Pigeon Spike Fixing Silicone to attach the strips to the ledge for a quick, easy and permanent fix. 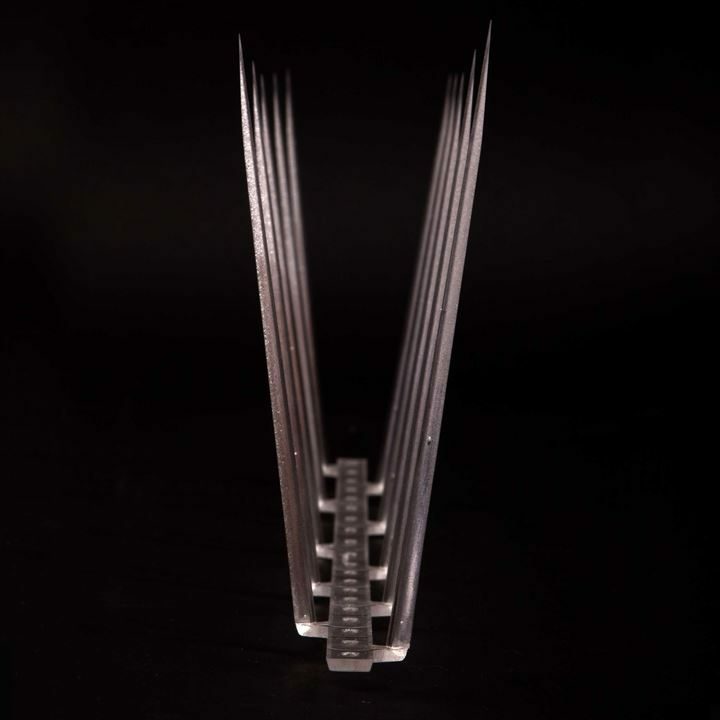 Click here to view Defender® 4 Narrow Plastic Pigeon Spikes - Installation Guide It is important to check the suitability of surfaces for use with Defender® Silicone. For more information, please visit the product page Defender® Fixing Silicone Adhesive Glue. Durolon UV stabilised polycarbonate plastic is used to manufacture the Defender® 4 Narrow Plastic Pigeon Spike. This tough plastic ensures that all Defender® Pigeon Spikes can stand up to extreme weather conditions without yellowing or becoming brittle. With this in mind, these pigeon prevention spikes come with a confidence-boosting 15-Year Warranty that no other UK manufacturer of pigeon spikes can offer. The Defender® 4 Narrow Plastic Pigeon Spike can be adapted to any length ledge or uneven surface. 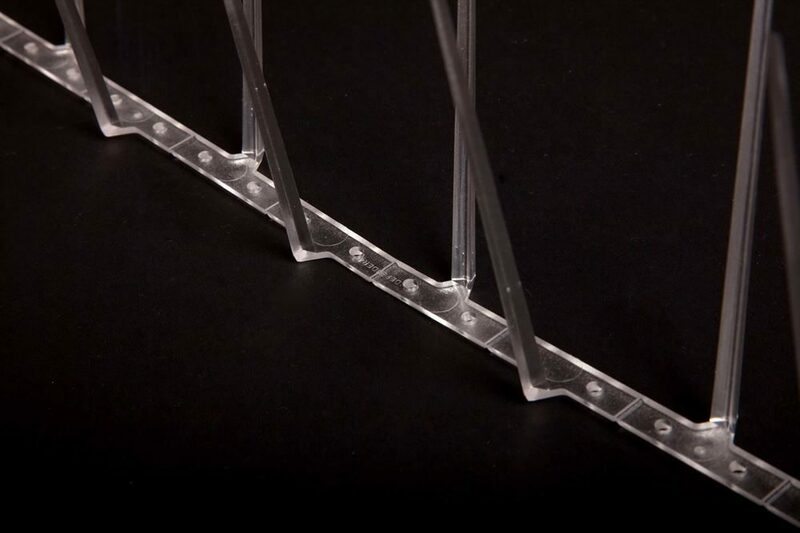 The base of the plastic bird spike has 10 breakable sections that are 3 cm or 1 inch long. Simply snap along the grooves on the base with your fingers and fix to the surface with silicone or your preferred method. This means protecting uneven or curved surfaces is much simpler and ensures correct coverage. The fact that no specialist tools are required makes installation quick and easy. The Defender® 4 Narrow Plastic Pigeon Prevention Spikes are constructed from UV stabilised polycarbonate. Using Durolon plastic means spikes will not become brittle in direct sunlight or any weather conditions. Jones and Son have given the Defender® 4 Plastic Pigeon Prevention Spike a Warranty of 15 years. This will protect your property from pigeons and other birds perching, roosting or nesting on it for years to come. It is important to check that the pigeon spikes installed on your property come with a warranty as there are many plastic pigeon spikes manufactured that are inferior products and will not protect your home. Jones and Son Pest Control Supplies Ltd is a family-run business from Devon in the UK. All our Defender® Plastic Pigeon Spike Products are manufactured from high quality Durolon UV stabilised polycarbonate plastic in a small town on Dartmoor. This ensures that Jones and Son can oversee every aspect of the production process, from designing to manufacturing, so each individual pigeon spike meets our exacting standards. No professional pest control equipment is required to install the Defender® Plastic Pigeon Spike. If you would like to view a Technical Data sheet for the Defender® 4 Narrow Plastic Pigeon Spike, please click on the image on the right to view a PDF which you can print for reference if required. Our Defender® 4 Narrow Plastic Pigeon Prevention Spikes have made a real difference to the quality of life of people trying to get rid of pigeons from their homes. Read Narrow Plastic Pigeon Spike Reviews. If you have a "How to prevent pigeons from nesting or roosting" question, please contact us and we will get back to you and start to help you solve your pigeon problem.